sections exposed along the rivers (Sinha et al., 2005). 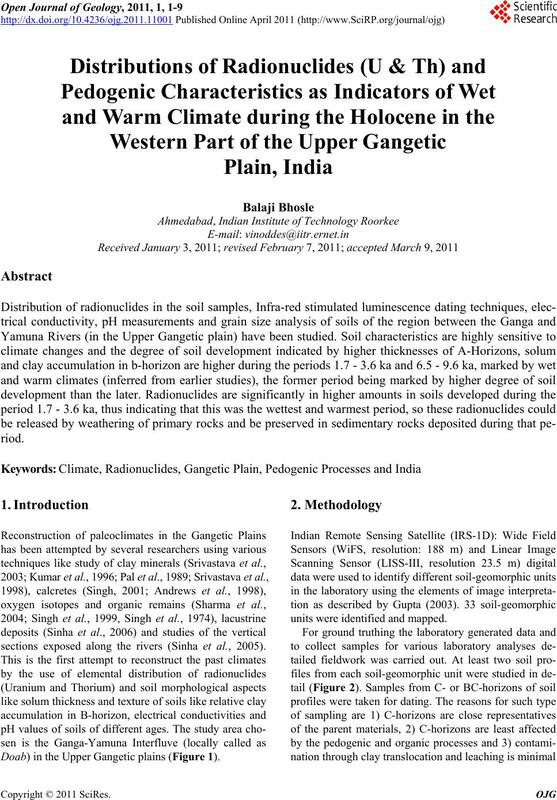 Doab) in the Upper Gangetic plains (Figure 1). units were identified and mapped. ameter) X 15 cm (length) metal cylinders. dating of Gangetic alluvium was carried out by Rao et al. tone medium and it was deposited on 40 aluminum discs. through 7 mm Schott BG-39 and Corning 7-59 filters. Figure 2. Map showing sample locations. (232Th) were measured using thick source alpha counters. from the signal from the sample (Table 1). 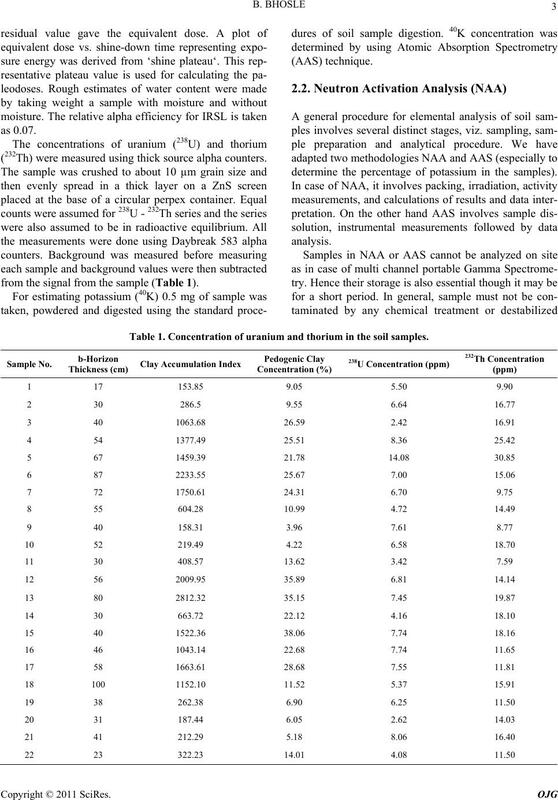 determine the percentage of potassium in the samples). Table 1. 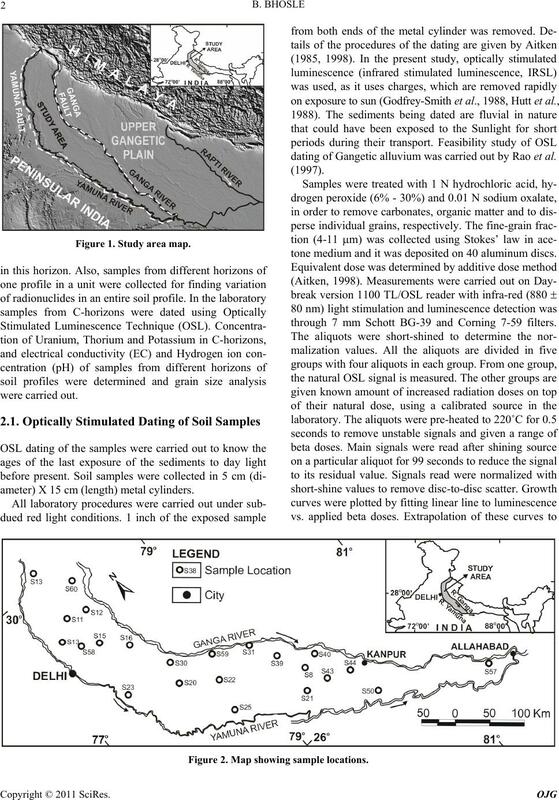 Concentration of uranium and thorium in the soil samples. sample is stored for further processing. having similar matrix from different agencies (Table 2). form of polypropylene) for long-term irradiation of 6 hrs. site and later at the Radiochemistry Laboratories of BARC. are usually complex with closely-lying multiple peaks. Table 2. List of standard reference materials. fication used by U.S.D.A. Soil Survey Manual (1999). C.A.I. ranges from 153.85 to 475.95 (Figure 4(c)). 2003) were marked by wet, warm climate. changes during the Holocene Period. pared to rest of the Holocene deposits in the study area. 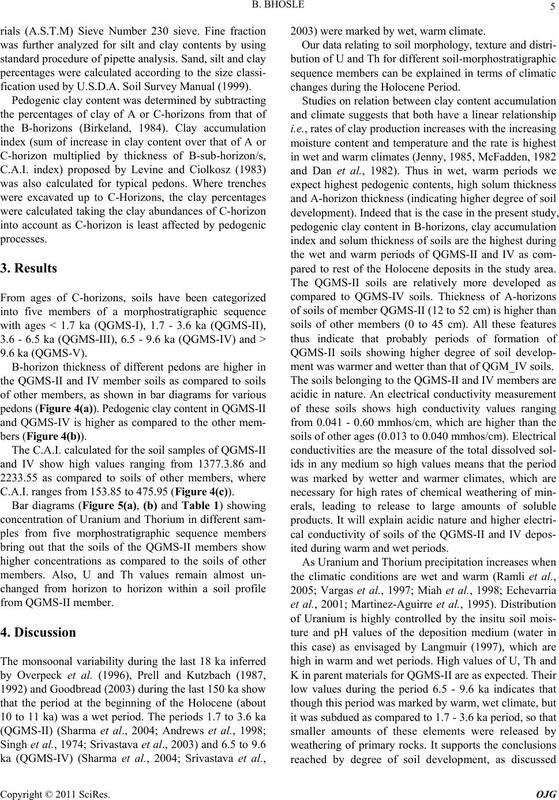 ment was warmer and wetter than that of QGM_IV soils. ited during warm and wet periods. soil profiles of different members. Figure 5. 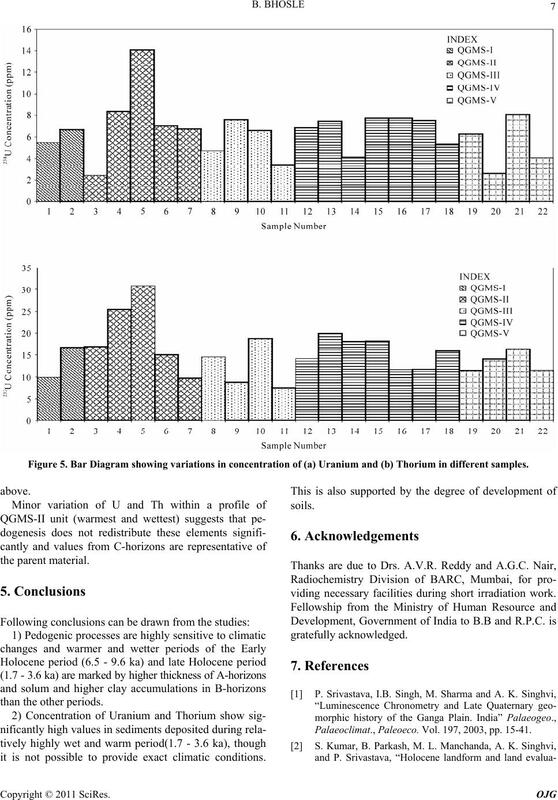 Bar Diagram showing variations in concentration of (a) Uranium and (b) Thorium in different samples. it is not possible to provide exact climatic conditions. viding necessary facilities during short irradiation work. Palaeoclimat., Paleoeco. Vol. 197, 2003, pp. 15-41. Vol. 103, 1996, pp. 283-312. 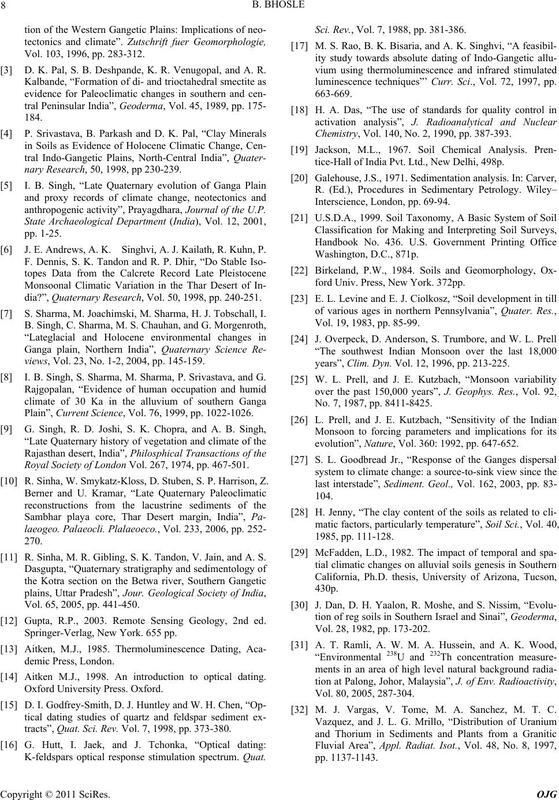 D. K. Pal, S. B. Deshpande, K. R. Venugopal, and A. R.
nary Research, 50, 1998, pp 230-239.
anthropogenic activity”, Prayagdhara, Journal of the U.P. 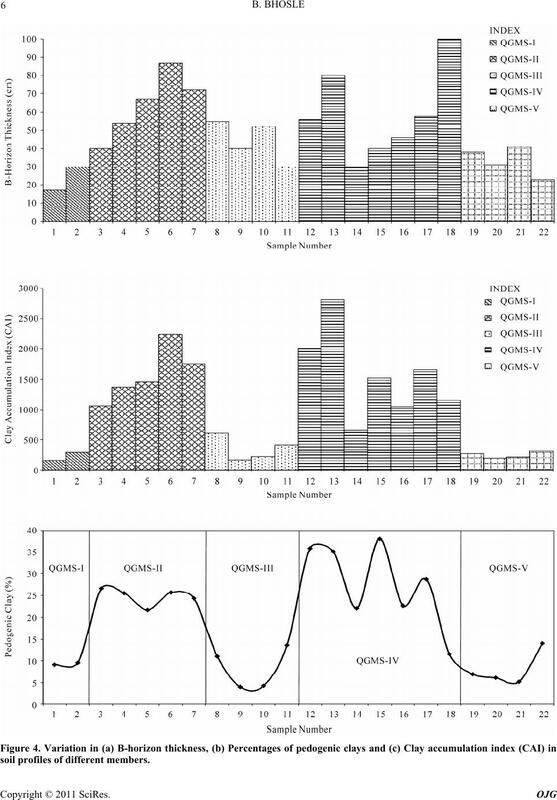 J. E. Andrews, A. K. Singhvi, A. J. Kailath, R. Kuhn, P.
dia?”, Quaternary Research, Vol. 50, 1998, pp. 240-251. 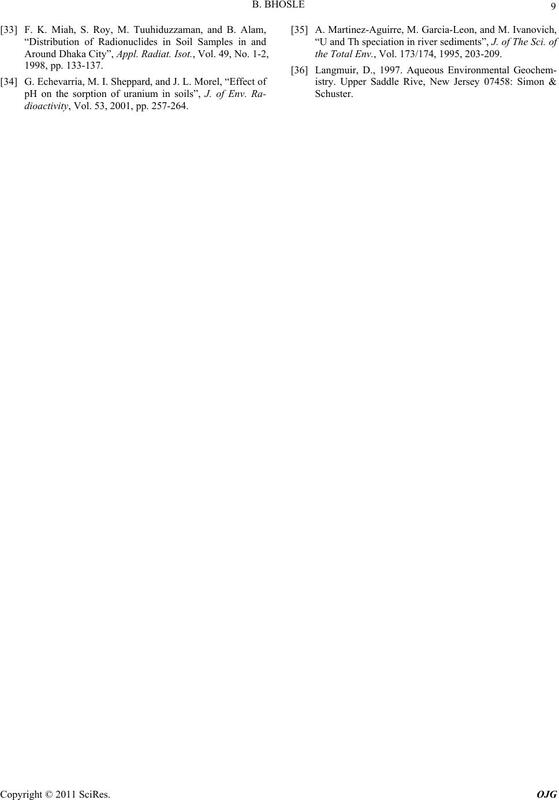 S. Sharma, M. Joachimski, M. Sharma, H. J. Tobschall, I.
views, Vol. 23, No. 1-2, 2004, pp. 145-159. I. 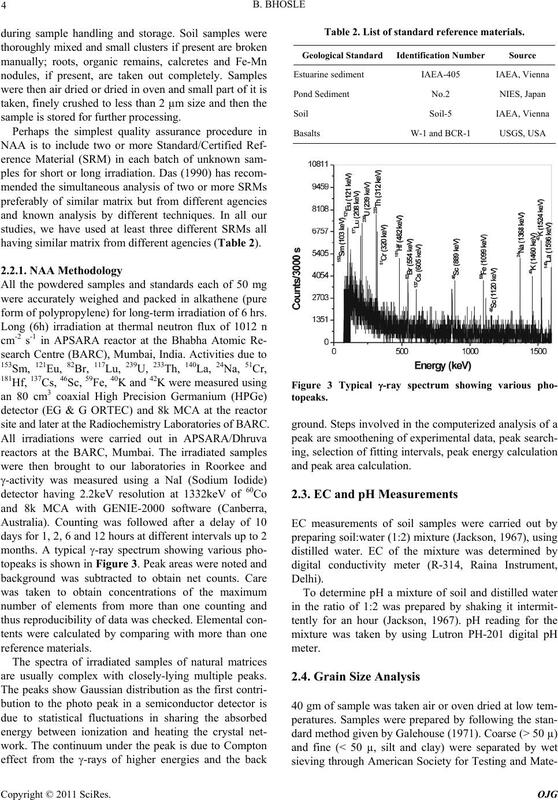 B. Singh, S. Sharma, M. Sharma, P. Srivastava, and G.
Plain”, Current Science, Vol. 76, 1999, pp. 1022-1026. Royal Society of London Vol. 267, 1974, pp. 467-501. R. Sinha, W. Smykatz-Kloss, D. Stuben, S. P. Harrison, Z.
 R. Sinha, M. R. Gibling, S. K. Tandon, V. Jain, and A. S.
Vol. 65, 2005, pp. 441-450. Gupta, R.P., 2003. Remote Sensing Geology, 2nd ed. Springer-Verlag, New York. 655 pp. Aitken M.J., 1998. An introduction to optical dating. tracts”, Quat. Sci. Rev. Vol. 7, 1998, pp. 373-380. K-feldspars optical response stimulation spectrum. Quat. Sci. Rev., Vol. 7, 1988, pp. 381-386.
luminescence techniques”’ Curr. Sci., Vol. 72, 1997, pp. Chemistry, Vol. 140, No. 2, 1990, pp. 387-393.
tice-Hall of India Pvt. Ltd., New Delhi, 498p. ford Univ. Press, New York. 372pp. Vol. 19, 1983, pp. 85-99.
years”, Clim. Dyn. Vol. 12, 1996, pp. 213-225. No. 7, 1987, pp. 8411-8425.
evolution”, Nature, Vol. 360: 1992, pp. 647-652. Vol. 28, 1982, pp. 173-202. M. J. Vargas, V. Tome, M. A. Sanchez, M. T. C.
dioactivity, Vol. 53, 2001, pp. 257-264.
the Total Env., Vol. 173/174, 1995, 203-209.